Some people were wondering about my computer workstation setup, so here it is! This is the place where I take large amounts of caffeine and convert it into large amounts of Ruby code for GigPark.com. The entire setup runs off my shiny MacBook — 2 Ghz Intel Core 2 Duo, 2 GB RAM. And yes, that’s a pair of rubber duckies that help me with my software development. 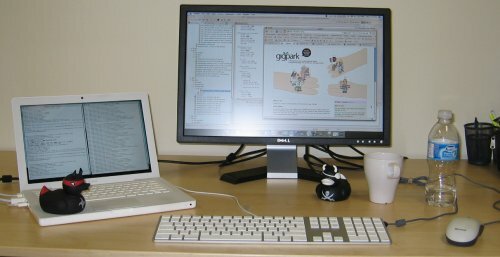 The main screen is occupied by Eclipse, while the laptop’s screen hosts webserver and autotest logs. The extra space is crucial for the development as it allows space to keep the background tasks by the side, not in the background. Having autotest visible is exceptionally useful as it lets me know if I’m breaking any code (assuming I keep up with writing my specs that is). Though then again, maybe a second monitor just makes me feel better about myself. You brought your ducks to work!!! I’ll be back on Monday to help you get through the “large amounts of caffeine”!! Apomb, you’ve got it all wrong! It’s you who has the same setup as I do in my office And don’t be so sure about the amount of coding done. I might be putting in a lot of time into though, but the application ends up being just a few lines of Ruby code. Actually that keyboard has a feel very similar to MacBook keyboard’s keys. I absolutely love it, it’s an awesome keyboard. It has just enough feedback to make it very enjoyable to use — I am now spoiled and have trouble with the conventional desktop keyboard that require you to press in a centimeter before registering a stoke.